My blogger buds over at Theme Thursday this week are going with "rhythm" for participating bloggers to post on. Each week a theme is thrown out and members are free to cover that theme in any way they please. 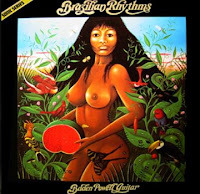 I won't be exploring Brazilian Rhythms. I just couldn't pass up using the picture. No, this week I've chosen a literary device with rhythm, poetry, to highlight of all things a form of birth control: the rhythm method. What do you call people who practice the rhythm method? Sadly their rhythm was way out of tune. Check out the other Theme Thursday participants. nicely played. maybe they should read these to high school kids...happy theme thursday. That is quite a pic. Goes with the little limericks below, me thinks. What else do you call the rhythm method? Something tells me Mrs. Noname must be very satisfied right now. Well you do seem to have a little something on your mind! Ha! Great angle on the theme. I found this theme more difficult than usual to convert over into a humor post. CatLady: Your church is more progressive than the Catholic Church. Wings: I loved the album cover. Have no idea how rhythmic the music is. Quirks: Mrs Noname's always satisfied! VE: You're right. It was a challenge. Would have been easier on my music blog. But it was fun. I stopped reading this post once I saw that Brazilian artwork. I love tropical fruits. But I'll bet the post was a real finger-snapper and toe-tapper! MikeWJ: Fruit? Funny, did you notice the woman was holding a melon? Don: I'm honoured. lol Send away! As a non-Catholic who married a Catholic, we had the pre-nuptual 'interviews' with Father O'Brien and of course the rhythm method was mentioned. Nope, I went the full on chemical pill and forgot it one night. . Bangarang . , maybe I should have paid more attention. Sorry haven't been by in awhile. My proof that the rhythm method DOES NOT work, just turned 18.